KBR 모바일 사이트, How bad are ‘mukbang’ shows, really? How bad are ‘mukbang’ shows, really? There’s no way around it: Koreans are getting fatter. Lifestyle and dietary changes ushered in by the proliferation of fast food sold at chain stores like McDonalds and convenience stores coupled with sedentary lifestyles are ushering in an obesity epidemic. The socioeconomic costs of obesity in a nation once deemed one of the skinniest countries in the world are expected to grow exponentially, doubling in the next 10 years. Accompanying diseases such as diabetes, high cholesterol, and high blood pressure are rising in tandem. Global organizations, such as the World Health Organization, have gone as far as to identify obesity as a significant contributor to cancer and classify it as a separate disease. It is against this background Korea’s Ministry of Health and Welfare has aimed to crack down on the obesity epidemic, publishing a series of reports on the rising rates of obesity in Korea. In the latest report released on July 26, the ministry outlined pre-emptive and comprehensive obesity prevention and maintenance measures that combine intersectional policies regarding nutrition, dietary habits, and physical activity. The overall goal is to keep obesity rates at 2016 levels of about 35 percent through 2022. Four strategic plans aim to strengthen education regarding correct dietary habits and encourage healthy food consumption, create a health-friendly environment and encourage physical activity, increasing treatment for the morbidly obese and supporting obesity maintenance, and improve public perception. Mukbang is a literal combination of two Korean words, to eat (mukda) and to broadcast (bangsong). The most notorious example is the TV program Delicious Guys, where four comedians -- notably overweight -- gorge upon several courses in one sitting. The allure of the program is in watching these four comedians eat for hours on end while making the audience laugh. Kim Jun-hyeon, who stars in the show, is one of Korea's most beloved comedians. However, it’s not just the Delicious Guys; these programs are everywhere. The craze of watching strangers binge-eat has been well-documented on live streaming platforms such as AfreecaTV, where these so-called BJs such as BJ The Diva and BJ Fitness Fairy, are paid a hefty sum to eat for several hours. 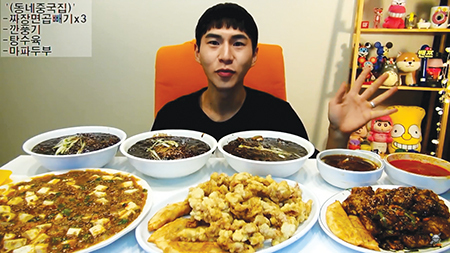 Individuals, such as Banzz, have also taken to Youtube to binge-eat for their viewers, sometimes eating 10 bowls of jajangmyeon in 13 minutes. The rise in individuals streaming live videos, where individual broadcasters are paid handsomely, up to $10,000, has led to an explosive increase in new, creative content while posing further ethical questions. However, the media widely framed the one-liner as one where the government is cracking down on mukbang programs with stringent regulations. Reports went as far to state the government would regulate programs that encourage overeating after 11 p.m., advertisements that promote high-calorie or low nutritional foods, and even internet programs through portal sites. The ministry fired back, saying that the report did not contain the word “regulation” and that it holds no legal enforcing power. It was, as the ministry explained, an attempt to “understand the current mukbang culture” not regulate it. However, it was too late. Media reports fueled a public fight between citizens, members of the government, and the country as a whole – revealing divisive opinions on how dangerous these shows are, really, and even to the question of to what extent the government should interfere in the daily lives of citizens. However, proponents of the regulations have quoted many studies that have shown food-related shows encourage and stimulate overeating. A study by Cancer Research UK showed that watching one extra junk food advertisement a week could equal to children consume an additional 18,000 calories a year in the study that involved more than 3,300 children and teenagers. Another study by the University of Liverpool on 176 children showed that social media stars might be encouraging children to eat unhealthy foods. The study divided 176 children into three groups where they were shown either picture of Youtube stars promoting unhealthy snacks, healthy foods, or non-food products. The children were then offered various foods, including health and unhealthy snacks. Results showed children who saw images of unhealthy foods ate an average of 448 calories, while others ate 357, indicating a 26 percent difference, according to the Independent. Despite the studies linking junk food advertisements and Youtube mukbang stars to overeating, the food industry remains worried that the guidelines will limit what has become a new “Hallyu.” These mukbang programs have gained popularity not just in Korea but around the world. The word itself has become recognized to stand for food-related programs. About 20 percent of Banzz content is viewed from abroad.